By Christian Takushi, Macro Economist & Geopolitical Strategist. Switzerland – 6 Dec 2018 – public release 24 hours delayed & truncated. In this report we are sharing our analysis on BREXIT first and then on the growing competition & tensions between policy makers. The latter a result of the escalating geopolitical competition between nations. Something very few investors are paying attention to. Over the past 36 hours I have updated our BREXIT assessment from 26 Nov 2018. As we have said over the past 20 months Mrs. Theresa May and Brussels are smartly steering Britain into the “desired chaos” that is increasing the likelihood of a Soft Brexit and boosting now the Remain Cluster of a 2nd Referendum, a THWARTED BREXIT or even a NO BREXIT. While Consensus portrays this as a defeat to Mrs. May, I disagree. We have been ascertaining since 2016 that Mrs. May is expected to remain faithful & committed to her strong liberal pro-European Remain convictions. Delaying a Soft Brexit Deal to the very last moment without preparing the UK for a No Deal Exit is the ideal “take this or descend into chaos” proposition. One that gives the Remain camp the upper hand, albeit not a guaranteed success. Can Britain’s political elite thwart Brexit and survive? .. after it assured voters “you will decide definitively in a 2016 referendum if the UK exists the EU”? Unfortunately for London’s political elite, they showed too openly their dislike for the decision of the British public and that they were bent on frustrating Brexit. Not preparing over the past two years equally on parallel tracks for a EU-blessed Exit and a No Deal Exit gave the negotiating advantage to Brussels and produced an ever weaker UK position versus the EU as time passed by. While Mr. Mervyn King fails to offer a solution, few UK leaders have exposed the Brexit ordeal as clearly as Mr. King did recently. Many conservative voices are raising allegations that May and Brussels colluded to thwart Brexit. I believe the British conservative leaders of the Leave camp can only blame themselves. Afraid or unable to assume responsibility in 2016, they handed over the government to a committed pro-EU leader – Mrs. May. Objectively speaking, she has outsmarted the Leave campaigners, frustrated Brexit and greatly advanced the Remain options. They still may end up over-playing their cards as they did in 2016 though. Mrs. May could be even commended – she is willing to face a personal defeat in order to see her nation staying longer in the EU or closer to the EU. Over the past 24 hours, British politicians, business groups and EU leaders are almost congratulating each other as they see the chances of a NO DEAL evaporate. 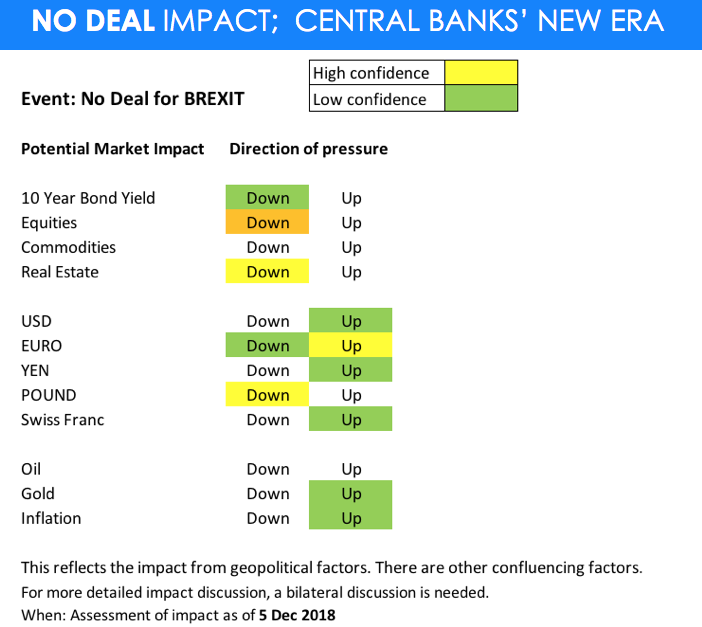 Not only do we cautiously disagree with that exuberant optimism, we also continue to see that a NO DEAL is what investors are least prepared for. We are thus, looking at mid & long term effects of a possible NO DEAL. Following the latest parliament moves in London and announcements in Northern Ireland, we have reassessed the scenario probabilities. I am focusing on scenario clusters, because every main outcome has now an array of sub-scenarios with overlapping permutations. As of last night the cluster of scenarios around a No Deal Brexit has a 35% likelihood (including a last minute EU concession to avert EU crisis). The growing cluster of scenarios around a Thwarted Brexit / No Brexit has a 45% likelihood. Some of these sub-scenarios imply a 2nd Referendum and London descending into chaos. The probability of new elections or a government/constitutional crisis is not negligible and could be part of either scenario cluster. Beneath analyst radars I see the modest but growing likelihood that Britons may also revolt at the political system in London. It is not working. The closer we get to March 2019, the more likely that Mrs. May and her Remain-cabinet members will take advantage of any development to help keep the UK in the EU or EU customs grid. NO DEAL is not a disaster – but Britons could have one ..
As I have written before, I am convinced that longer term the UK can do well totally independent from an over-regulated EU. Anglo-Saxon economies can thrive under pressure. Thus, a No Deal or Last Minute Deal is not necessarily a disaster, but it could become one as many powerful forces may want to add to the chaos in order to advance their interests. Therefore, the response by EU governments as well as by British business leaders needs to be closely monitored. Our scenario analysis show that Brussels should fear a No Deal more than the UK. For over three years now UK businesses and public servants have been bracing for difficulties. Not so on the continent. We therefore are not ruling out that Brussels may offer a last minute solution in the run-up to an imminent exit of the UK without a Deal. Defenseless EU until 2025 .. In recent speeches I have highlighted the impact BREXIT is having on the Global Arms Race, Europe’s rearmament and aggregate demand (positive effects). Europe has challenged Russia and the USA, while prematurely embracing China as her new Global Champion. But China cannot defend Europe nor the Trading Routes on which Europe depends upon. Lacking strategic foresight, Europe lives below her potential. Take note: Brexit is taking place at a time, when existing and rising powers cannot fully trust each other. There will be soon more alliances than competing nations. 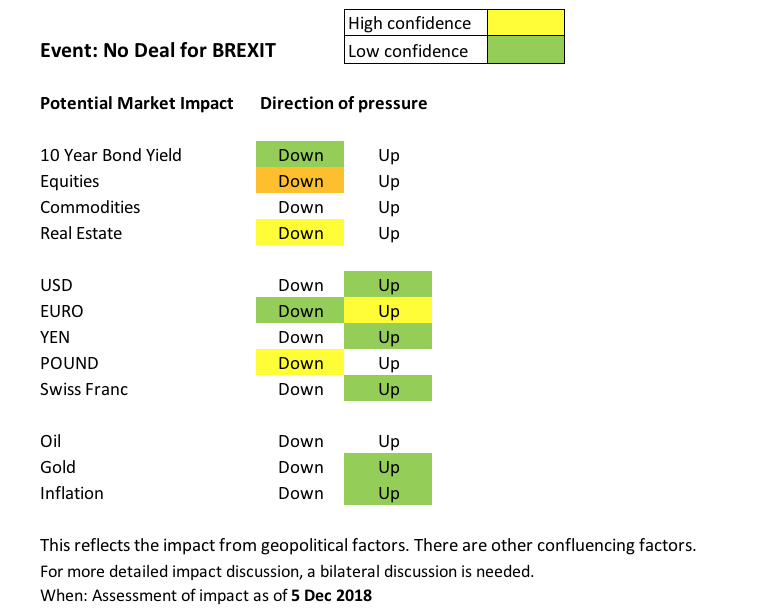 A ‘worse case’ in the short term for markets: There is a chance that London may fall into a temporary “political implosion” or “constitutional crisis” in case of a rejection of May’s Deal in parliament. The latter could be decidedly more chaotic than the aftermath of the Brexit referendum in 2016. While markets may first re-price UK assets and the POUND, benefitting the EURO, the subsequent chaos in the EU itself could also weaken the EURO. Markets are underestimating the coming EU problems. I think markets have aligned themselves already with a Soft Brexit Deal or even a No Brexit. The current deal in investment terms is “the giving up” of long-term potential in return for immediate comfort. Most European governments, think tanks, financial media, universities, businesses and investors want a Soft Brexit – with the intrinsic hope that the whole exit process may be called off. No Brexit would lift UK assets and the Pound immediately. But in the long run – under tightening EU rules – the UK will underperform other key economies. In a broader sense BREXIT is not just BREXIT, it has become an accelerator of trends that investors were able to overlook for years. Just to mention one: Europe’s security & nuclear shield are fading fast; Europe will re-militarise significantly – but, not soon enough. After 10 years of artificial stability and asset price inflation .. markets are not prepared for the amount of change that is coming over Europe. Yes, change can be worse than crisis. Governments, already a huge employer and generator of jobs across Europe, will become bigger still. Not only that, with a more polarised and weaker Germany (lacking Britain’s support), the reduced fiscal discipline and deteriorating security will impact risk premiums. Normally investors seek the safety of government bonds in times of crisis, but ..
Christian Takushi MA UZH, Macro Economist & Geopolitical Strategist. Switzerland – 6 Dec 2018. Soon access to our research will be restricted – The introductory pricing will stop and normal pricing start.